Basic Idea: Golden should seek to be a partner/participant in any legitimate regional effort to implement transportation solutions that meet our Golden Vision (GV) 2030 values and goals, including reasonable compromises on beltway-related issues. Could result in transportation improvements that meet our goals, are sensitive to Golden’s unique nature and address Golden’s future traffic needs. Could result in Golden having a greater say in the design and implementation of future projects, and regional support for GV 2030 goals. Could increase Golden’s ability to influence other regional issues through enhanced regional engagement and resulting in good will. Participating in regional efforts will require a substantial time and resource commitment with no guarantee of results acceptable to our community. This could hasten the implementation of transportation initiatives that are not fully aligned with GV 2030. Golden needs to have a say, but we need to consider the surrounding areas and how to draw them in rather than push them away in any plan. If there is compromise what will Golden give up? Control of sequencing of improvements is imperative. TRAFFIC SOLUTION vs. GROWTH STIMULUS: Hwy 93 to Boulder should be #1 before Jefferson Parkway Tollway. I believe we need to work more closely with surrounding areas, but I also believe we should have support in any approach with other communities, and more help to accomplish City goals. Maybe we can involve Council, Arvada, Broomfield, Boulder, etc. Golden should negotiate the BEST deal possible in all cases. Golden has to be at the negotiating table in order to get anything out of this process. But we do not need a beltway and should NOT budge on that issue. Any improvements to 6/93 should include additional lanes if we are doing the work, and build for the future. Golden has to be a player at the table regarding any and all modifications to the 6/93 corridor within the City limits. Some of our tax money has to be spent to insure that any compromise to the corridor is compatible with the Golden’s citizens’ desires. Negotiation is the only way that Golden will have any input on the design. NEGOTIATE! See the Rocky Flats lawsuit through to the end. That was bad process. Muller 2 (Managed Lanes, etc.) should be the price for Golden’s cooperation. We need most or all of the new Golden Plan. Absolutely needs sound berms. It is important not to join a partnership that undercuts the features which are now being presented as key elements on 6/93 that are in keeping with the 2030 vision plan. I feel this is a fight we may not win. So FIGHT HARD but also work with others. Compromise to me means not having a toll road particularly if funded by companies with foreign owners! We should rename this Alternative #3 to be more positive – ie: “promote” instead of “fight”. Go this way! Remember the silent majority. Full Muller Plan fully funded prior to agreeing to Jefferson Parkway or incremental improvements. Golden control of sequencing of improvements. Hwy 6 / 19th Street funded separately due to needs of CSM. No tolled lanes — it will only create congestion in our city. City Council needs to completely fight this. There is no study saying a tollway and extension will alleviate traffic congestion. Golden needs to get as much as it can at the start. At the Transportation Open House meetings, each alternative was posted, and attendees were invited to vote with star and circle stickers on the alternatives they liked and disliked. Below is a tally of those votes from both meetings. 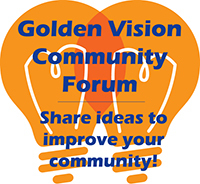 On the Golden Vision Community Forum, the public also had an opportunity to vote for the option they liked best – this option received 14 votes.